Wildlife can be a danger to fishermen. It can be dangerous as a catch, such as whales, or by interfering with nets and boats. Scotland had long been involved in both Arctic and Antarctic whaling. This dates from the 12th century or earlier. The most active period of British whaling began in 1750 and by the 1780s trade was booming. By 1845 Peterhead had overtaken Hull as the leading British whaling port. It held this position until displaced by Dundee in the 1870s. Long voyages and harsh conditions made the life of the whalers hard and dangerous. Whaling ships had a crew of around fifty men including a doctor, blacksmith and carpenter, as well as harpooners and flensers. They had to carry all they needed for an eight-month voyage. This included whaleboats, harpoons, flensing tools and casks to hold the blubber, as well as food and clothing. Some crews supplemented their diet by hunting, fishing and collecting birds' eggs. However, the lack of fresh food often made them ill and led to ailments such as scurvy. Conditions in the Arctic could be treacherous. It was common for ships to be frozen in the ice, some being trapped for weeks or even crushed. The most dangerous job of the whalers was the actual harpooning. 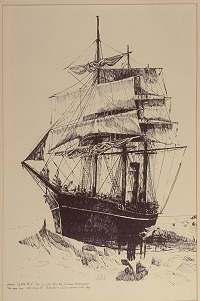 Each whaling ship carried seven small boats, each with a harpooner and crew of rowers. When a whale was spotted, the boats were launched and sped after it. The harpoon was thrown or fired from a gun and had a long line attaching it to the bow. When the harpoon caught in the whale's flesh, the boat would be towed along behind as the whale struggled to get free. Other boats would come alongside to add their weight. Sometimes a whale did escape, either because the harpoon did not hold, or by diving under the sea, or ice. Then the boat might be pulled under with it, if the line could not be cut. You can find out more about whaling in Hunting the Whale. Some marine mammals are problematic for fishermen. They can damage or interfere with fishing gear or catches. Seals are disliked by fishermen because of the damage they do to fish caught in the nets. Instead of taking a few fish whole, they often take a bite out of many fish, leaving them all spoilt. The nets are torn in the process leading to lengthy and expensive repairs. And, of course, the loss of the catch means that the boats must go out again to brave the seas once more. This is a particular problem for stake netters such as the salmon fishermen of the Tay and Montrose areas. Indeed, certain fishermen on the Tay have a license to shoot seals if they interfere with their nets. The dogfish is a small shark. Although edible, these fish can be a particular nuisance to the fishermen. They can damage nets and eat the fish. They will also take bait from creels. In summer, jellyfish can also be a problem. If they became tangled in the nets, they could sting the hands of the fishermen.